The Banaras Hindu University (BHU) has released the hall ticket for the BHU SET 2019 Entrance Exam. The BHU is conducting the School Entrance Test (SET)-2019 examination for candidates who applied for the admission in Class 6, 9 and 11. The BHU SET 2019 exam will begin from April 25 and the tentative date for result declaration is June 10. The Banaras Hindu University (BHU) has released the hall ticket for the BHU SET 2019 Entrance Exam. The BHU is conducting the School Entrance Test (SET)-2019 examination for candidates who applied for the admission in Class 6, 9 and 11. The BHU admits each year girls and boys in classes 6, 9 and 11 in the Central Hindu Girl's School and Central Hindu Boy's School through School Entrance Test. The candidates who have applied for the BHU SET 2019 Admission should visit the official website (bitsadmission.com) now to download their hall ticket. The BHU SET 2019 exam will begin from April 25 and the tentative date for result declaration is June 10. The candidates having Hall Ticket will be allowed to appear for the examination. If you are one of those candidates who have applied for the exam should follow the steps mentioned below to download the Admit Card from the official website. 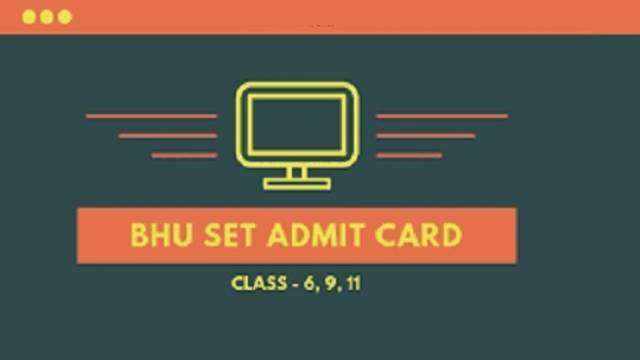 ♦ On the homepage, click on the "BHU SET-2019 Hall Ticket Download Link"
♦ BHU SET-2019 Entrance Exam Hall Ticket will appear on your screen.